We got our day permit at the Algeria office (which opens at 7h30). This is free with a Wildcard. The walk up to the Waterfall is given as taking 3h round trip but we comfortably walked up to the impressive waterfall and deep gorge in an hour. The walk was in the shade which made for really pleasant conditions on the switchback ascent. After a brief stop at the waterfall we continued up to the vlakte where the hut is. This is very basic and we did not stay long, walked to the oak tree cluster and crossed the river and then followed the path up to the five way viewpoint as per Peter Slingsby’s map. This is the highest point and the end of the climbing. You can see across to Machine Gun Ridge and down the valley which you are about to descend. The descent is pretty long and the path is loser than the rocky ascent. Clearly it sees much less traffic. We continued to contour around until above Jamaka. I ran back along the traverse to collect the car while M headed down to our chalet. A fantastic outing. Quite amazing that this has virtually the same distance and elevation gain as the Two Ocean’s trail run. It would be pretty cool to attempt to run this in close to 2h! I love the organic farm Jamaka situated at the bottom of the valley as you crest the Niewoudt Pass from the N7 – 5km NW of Algeria. We have spent many a weekend either camping or staying in one of the chalets. They are great. Jannie and Katrin have made some nice walking paths on their property. 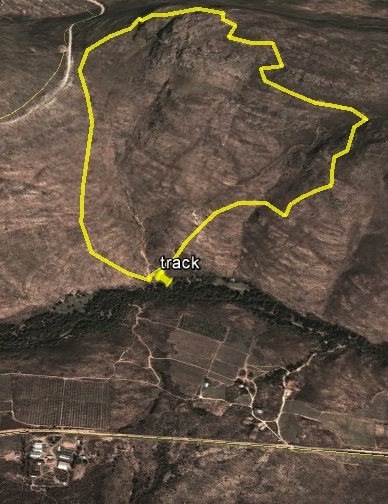 The Rooiberg trail is circular and starts from campsite 17. The River Walk which traverses the valley in either direction from here can be accessed from here. Follow the 4X4 track up the steep slope until you see white painted arrows indicating the way. It is pretty steep uphill until you reach a nek. 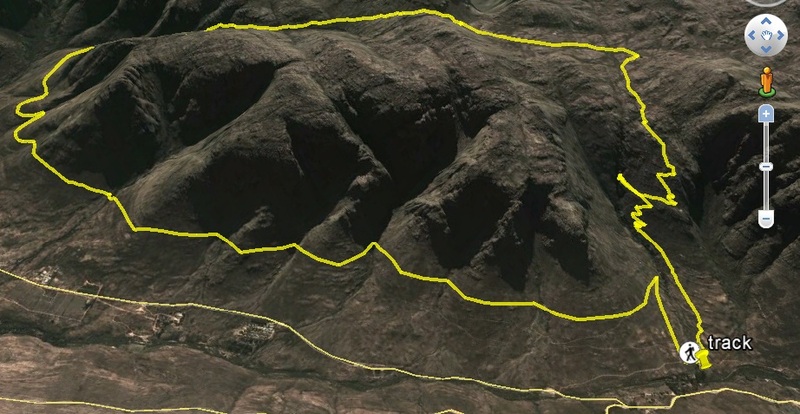 Rooiberg is to your left and the larger Wolfberg (not to be confused with the Wolfberg Cracks above Sandrift) is to your right. Turn left and past the Vodacom mast to gain some more height to the summit. Over the top and views towards the N7 before snaking your way through some rocky section to descend steeply to the Pass and then a straight line back down to the start. As a run sub 30 minutes to the summit is what you want to aim for and then a quick descent down should give you a sub 60 minute outing. If you are less fit or want to walk then 3h is about right. If you want to do the longer and less trodden Wolfberg Trail then just turn right at the first nek. The path winds through some rock formations and cracks before descending and traversing back to the campsite. Well done to Jannie and Katrin for their hard work in establishing the walks one their farm. So you didn’t run either of the walks just to check that your thoughts were true!!! Hi Dion. I ran the second one which was a great little outing in about 48 minutes. The Waterfall – Middleberg route was M and my day walk together. I ran the last 7km to collect the car. Absolutely brilliant though.